BLACK is the default color. (there were bottles made in RED, but they are sold out). These bottles measure about 10 inches tall and 3 inches wide. With a 32 ounce capacity, they are essentially the same size as a 1 liter bottle. 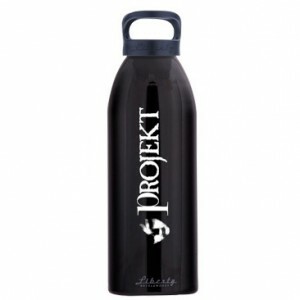 This bottle is great for the car, your desk at work, taking to the beach or fireworks. We also have a 24oz Water Bottle. Narrower, for your book bag. Sam writes: For many years, I have been looking for a water bottle made in the U.S.A. You wouldn’t imagine how hard this has been. I have nothing against people from other countries, nothing against their right to make a decent living. The fact is I wanted to support American workers, since most Projekt CDs sell in the USA. And then,I found it!!! Liberty Bottle Works is a company in Yakima, Washington, that makes their bottles with all the values that are important to me! Recycled material, domestically made, donation to charities. The graphic on the bottle is the Blacktape face next to the Projekt logo – both in a very light grey ink. An homage to the 1980s Spin Magazine ad, when the face was often used as part of the Projekt design. * Open up and say “ahhh” to PBA-free water. The wide mouth threadless design makes for easy cleaning and is ice cube friendly. * The ONLY American made metal bottle in the marketplace. * Recycled and Recyclable. Liberty Bottles are the ONLY bottle to be made from recycled materials. * Deep Drawn Aluminum Construction. | Fewer dents, greater durability, and precision construction. * Drink Confidently. | Flexible Food Grade Coatings insure no chips or flakes end up in your water. Unlike uncoated metal bottles, our coating insures no heavy metal leaching or porous surface for bacteria build up. * Simple 1/4 turn on/off design | No more turning and turning. * Splash-free drinking. | The gradually tapered neck mimics the smooth pour of a wine bottle. * Fight Hunger! | Buy art from your local starving artist. We do! We search out local, small, and unique artists. * Commitment to safety. | Liberty Bottles exceed FDA requirements, are nontoxic and non-leaching. Independent Lab Certified to be 100% BPA FREE.